Progressive writer Elizabeth Magie Phillips created Monopoly in 1904 to teach players about the dangers of wealth concentration. Originally called The Landlord's Game, it celebrated the teachings of the anti-monopolist Henry George whose widely read book, Progress and Poverty, published in 1879, argued that governments did not have a right to tax labour. They only had a right to tax land. Monopoly didn't become a hit until the Depression. Its original message that all should benefit from wealth was transformed to its current version —where you crush opponents by accumulating wealth —by its second developer, an unemployed heating engineer named Charles Darrow. By the mid-1930s, orders for the game had become so extensive that employees of Parker Brothers stared piling the order forms in laundry baskets. Many of the games in circulation today are more than a century old. Pitt (originally Gavitt's Stock Exchange) was made during economic panics, railroad failures, speculation and anti-monopoly movements. Patented by Harry E. Gavitt in 1903, the game was designed (as the rulebook says), to reproduce the "excitement and confusion generally witnessed in stock and grain" exchanges. In 1899, a newspaper columnist in The Seattle Post-Intelligencer wrote that "toy makers…are as watchful as politicians and scientists to keep abreast of the events of the day." Yet for all that has changed, we still play these old games, even if we don't remember their lessons. "They used dolls to teach sewing, ingenuity, and household management to girls." -??? Toys are expressions of innate human activity. The tropical female animal is born with the innate urge to reproduce and thus feels complete with a baby in her arms. She practices feeding, cleaning, and grooming it, putting it to sleep, talking to it, dressing it, etc. Human males survived the rigors of first intra- and then inter-tribal conflict by being proficient with weapons. Their weapons were their constant companions. As such, the tropical male human domesticated animal feels incomplete without a weapon in his hand. Male children practice combat, wielding the weapon, carrying it, maintaining it. These urges are often expressed symbolically. Boys wield bats, practice curve balls, oil and work their catchers mitts. The marketing ploy from baby dolls to barbies reflected the entirely artificial switch from making babies/growing pops to emancipating women to reduce growth. The reluctance of academies to acknowledge this shows their role in enacting this grand sociopolitical shift. Their job isnt to explain human behavior but to help modify it. Human domestication is the primary role of educational institutions. Kids are removed from their incipient cultures as early as possible and taught how to act, what to think, and what to expect. 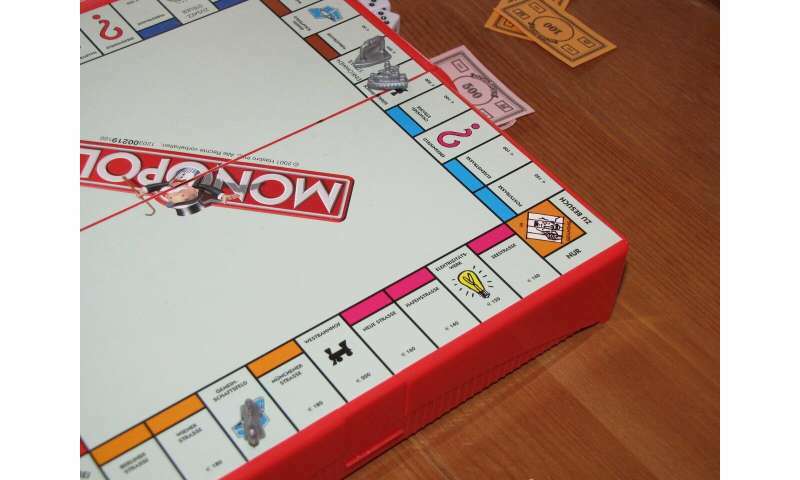 "Monopoly didn't become a hit until the Depression. Its original message that all should benefit from WEALTH was transformed to its current version —where you CRUSH opponents..."
-The author isnt analyzing. They are TEACHING the morality du jour. Monopoly was popular during the depression because it provided a fantasy of hope. It reinforced the illusion that possessions meant happiness, a concept that would support the global postwar expansion of industry and consumption. Academies are now tasked with vilifying growth and expansion as they are no longer global imperatives.